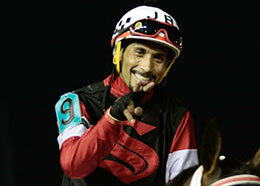 Jockey Jose Beltran won the 2918 Quarter Horse Jockey title at Indiana Grand Racing & Casino. SHELBYVILLE, IN—NOVEMBER 8, 2018—It was another great season for Jockey Jose Beltran at Indiana Grand. Although he has been close in recent years, 2018 marked his first Leading Quarter Horse Jockey title. Beltran, a native of Mexico, completed the season with 30 wins in 146 starts with more than $652,000 in purse earnings accumulated. He was 10 wins ahead of Sergio Ramirez, who finished in second place with 20 wins. Beltran rode several stakes winners throughout the year, including Dominyun Cartel in the $180,300 Miss Roxie Little Futurity, the second highest stakes victory of his career. Beltran also connected for stakes wins in the $131,000 Blue River Derby and the $76,000 QHRAI Stallion Service Auction Derby with Rocky’s Candy Shop, the $130,000 Jaguar Rocket Futurity with Daddys Moe, and the $90,000 Harley Greene Derby with Beach Mercedes. "I owe everything to Roy and Penny (Moore)," said Beltran. "For four years, they helped me for my Visa. And, I’ve had a really good year this year at Indiana Grand. If it weren’t for those two, I wouldn’t be here today. I love you guys." Beltran is now ranked fourth on the list of all-time leading Quarter Horse jockeys at Indiana Grand. In only five years of riding at the track, he has accumulated 93 career wins and purse earnings in excess of $2 million. He joins jockeys Harold Collins, Rodney Prescott and Shanley Jackson as the only Quarter Horse riders to ever eclipse the $2 million mark in career purse earnings at Indiana Grand. Beltran completed his season following the final all-Quarter Horse racing night of 2018 Saturday, Oct. 27. He and his family have relocated to Oklahoma for the winter months. Rachel McLaughlin, on-air racing personality accepted the award for Beltran during the final night of racing Wednesday, Nov. 7. The 16th season of Thoroughbreds and Quarter Horse racing concluded Wednesday, Nov. 7. Racing will resume in April 2019 with dates expected to be released by the Indiana Horse Racing Commission in December 2018.